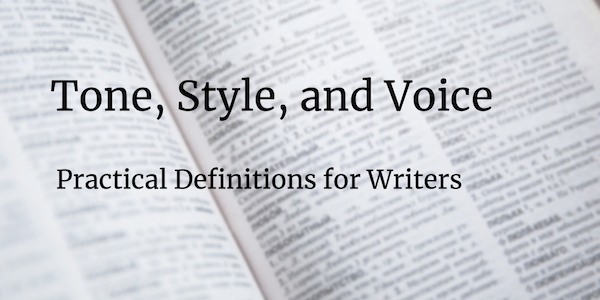 Tone, style, and voice – what do we mean by those words? Is it worth being accurate and distinguishing between them? In the past, I’ve tended to use the words together, writing about “tone and style” although they are clearly different things. So I started looking for more precise definitions. In searching for a decent definition of tone in Merriam-Webster, what do I find? Style. Okay, then what is style, relevant to writing? Why not check The Chicago Manual of Style? One sits on my desk, its bright orange cover faded almost white along its spine. In addressing style, it covers writing mechanics and conventions from the structure of a book to the detailed questions of whether the footnote superscript appears inside or outside of punctuation. So, style is all of this? There are other camps. The book Clear and Simple as the Truth, by Francis-Noël Thomas and Mark Turner, takes as its subject the concept of the classic style of prose. The authors describe this style as an amalgamation of attitude, approach, philosophy, and other attributes. There’s not a single mention of how to format footnotes in it. Here’s the problem: this vague overlap makes the whole issue of tone and style seem amorphous and difficult to control. How can I possibly manage tone and style in revision if I don’t even understand what I’m talking about? Some part of this equation is instinctive. Without giving it a lot of thought, you adjust your writing style automatically when drafting an email to a friend arranging a weekend dinner versus your manager asking for a raise. Somehow, you understand how to write to create a different effect and feeling. Instinct is only the starting point – you can make changes in revision that have a major impact. You don’t control everything; people may misinterpret what you write. Ultimately, what matters is what the reader perceives, not what you intend. So, let’s create definitions that differentiate between what happens automatically in our writing, what others perceive, and what we can control in revision. Here’s my pass. Your voice is how your thoughts appear in writing naturally – your writing voice is unique to the way that your brain assembles thoughts and words. Just as your loved ones can recognize your spoken voice, your written prose may bear your unmistakeable signature – at least in first drafts. You don’t have a lot of control of your innate voice, but you can adjust it in revision. Tone is decided during reading, not writing. It’s subjective – what matters is what the reader feels, not what the writer intends. You may be excited about your topic, but if you ignore the reader’s needs and interests entirely, you may come across as condescending, pedantic, or boring – most likely not the tone you were hoping to achieve. Your voice is the starting point, and is mostly out of your direct control when writing freely. However, you can influence voice by imagining the reader when you write and revise. The tone is how the readers judge the writing – did it seem like a conversation? (See this post for my take on the conversational tone.) Was it hard to read? Was it formal or informal, exciting or dull? Style refers to the means by which you achieve the desired tone, and includes everything from sentence structure and word choice to playing fast and loose with grammar. In a future post I’ll cover some of the ways to influence your tone in style. I recognize that countless people have defined these terms, so my suggestions may be too little, too late. But I find them helpful in my own work, and share them in that spirit. If you’re interested in ways of tuning your tone through revision, see the course Revising Your Writing.